Throughout your child’s development, and through each Preschool class, you will address significant parenting issues that will both challenge and frustrate you. Through in-depth discussion with your instructor, teacher and peers at monthly parent education meetings, we will address these issues and look at ways of building effective parenting strategies and skills. As we work through specific topics, you will have the opportunity of practicing solutions in the Preschool classroom, with the guidance and understanding of the teacher,the Parent Instructor, and of other parents. 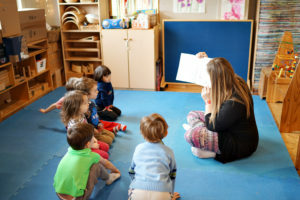 Below is a suggested reading list that covers most of the topics that will be raised through-out you and your child’s involvement in the Preschool. Specific issues can be discussed in more detail at parent ed meetings, or privately, one-on-one with your instructor. Gesell Institute Books: Your One Year Old, Your Two Year Old, etc. by Jane Nelson Ed. D.
by Lawrence E. Shapiro Ph.D.
by Ava L. Siegler, Ph.D.